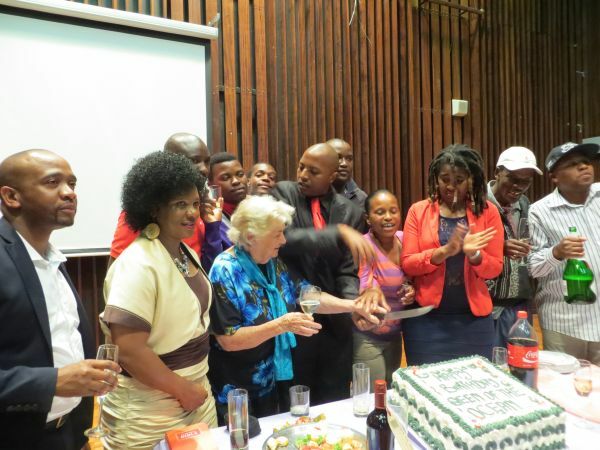 Dancing Pencils held a party for colleagues and friends of Ukhozi fm radio journalist Nhlanhla Nxele, at the SABC headquarters in Durban on his birthday, Friday 15th of November. Pastor Benjamin flew down from Johannesburg to bless the occasion. Nhlanhla was honoured to have present Mr Sibiya from the Office of the Premier as well as a group of the Willowfontein Dancing Pencils Writing Club members from Pietermaritzburg. This group entertained the audience with a song. Nhlanhla was congratulated by Durban Regional SABC News Editor Nhlakanipho Zulu who spoke of Nhlanhla’s growth as a journalist and as a person. Nhlanhla does a lot, via his radio work, to help with literacy by interviewing children, especially rural children, on their writing successes. He came with Dancing Pencils and the Office of the Premier to the Cape Town Book Fair in 2012 and had a busy time, interviewing the young ones and reporting this back to the SABC studio in Durban. He has also, in his own spare time, been going with Felicity on a weekly basis to workshop men prisoners on right brain writing in the Westville Maximum Security Prison, Medium B, so we thank him for his involvement with literacy in our country. Amongst the other illustrious people present was Ms Sindi Dlamini, General Manager IT of Transnet who gave an informative talk of the good work done by Transnet. This happy party concluded with the cutting of a giant sized birthday cake!